Rare Books and Special Collections at UBC Library is delighted to announce a new exhibition! 2017 marks the bicentennial of Jane Austen’s death, an author who has left an ever-lasting literary legacy that continually influences popular culture across time. 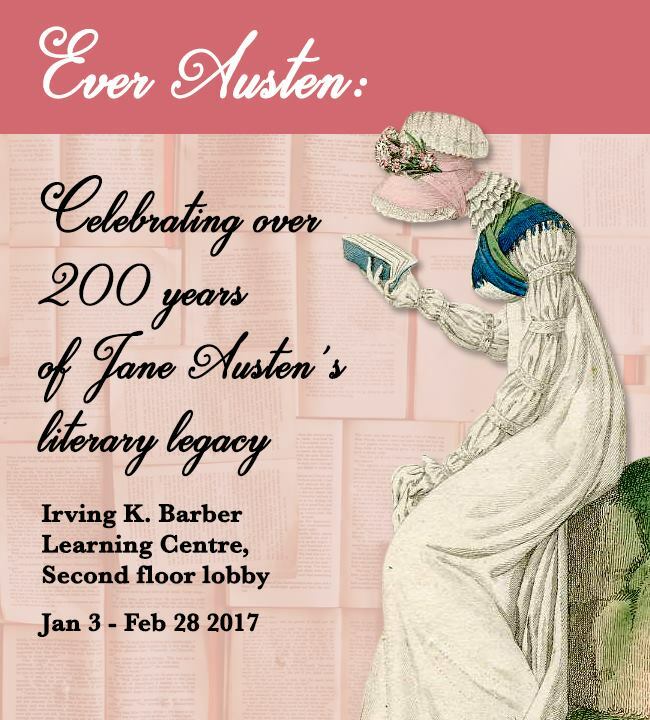 In celebration of this legacy, RBSC presents Ever Austen: Literary Timelessness in the Regency Period, curated by UBC undergraduate students Kathryn Ney, Karen Ng, and Karol Pasciano. This exhibition not only honours Austen, but also illuminates the social and material history of her works in the context of the Regency era. Featuring RBSC’s newly-acquired first editions of Austen’s Northanger Abbey and Persuasion, as well as thematically-diverse displays, Ever Austen invites Austen fans old and new to experience a literary journey through the late eighteenth and early nineteenth centuries. A panel discussion on Jane Austen’s influences, work, and legacy will take place on Friday, February 3.